Drinking your way to better performance. 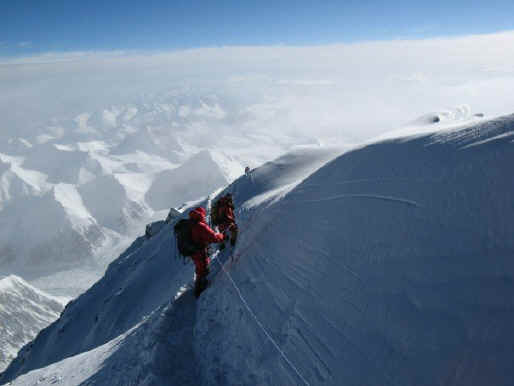 Mountaineering while at high altitude is an immense physical and emotional challenge. Mountain experiences can be strengthened by strong physical training, acclimatization to altitude, emotional preparedness, and careful choice of food and beverages during the months of pre-climb training and while at altitude. Not only will food and fluids support your training program, but nutritious choices will support muscle repair and recovery following your ascent. Perhaps due to the enormous number of details involved in planning and undertaking a high altitude ascent, the consideration of high quality food and beverage choices has often been over-looked. Fortunately this is changing as emerging research shows how important food and beverage choices are for maintaining strength in high endurance activities. “Eating for Everest” incorporates the principles of sports nutrition, yet takes into account the particular challenges posed by high altitude. “Eating for Everest” will provide regular and relevant nutrition updates, offer mountaineers an opportunity to “Ask the Dietitian”, and offer Peak Freaks clients personalized nutrition support. Given that the nutritional needs of women differ from men, this site will provide women mountaineers with current and accurate nutrition information to support their health and wellness. Be sure to check “Eating for Everest” regularly for new information and features. Your feedback and suggestions for content are encouraged. Helen Lutz, MPH, RD is a Registered Dietitian living in Nelson, BC. Over the past 15 years Helen has developed expertise in nutrition education, chronic disease prevention, media and public speaking, and involvement in health promotion and wellness initiatives. Helen is highly regarded for her ease of communication and practical approach to translating the science of nutrition into everyday language and practice. Helen enjoys telemark skiing, cycling, baking, gardening, and being a mom to her boys. Helen, her husband and two young sons enjoy adventuring together in the great outdoors. Helen's contribution to the Peak Freak team is extremely valuable. Helen offers climbers and other athletes expert guidance in nutrition and meal planning to help attain conditioning prior to their adventures. Healthy eating is important for healthy living and aging. Canadian studies show a gap between the nutritional intakes of men and Canadian nutrition recommendations. Every day, one third of the energy intake of men is provided by foods rich in fat, sodium and/or sugar and poor in nutrients. More than half of Canadian men fall short of the daily recommendation for fruits and vegetables, as well as dairy products. According to the World Health Organization, these food behaviours constitute a major risk factor for chronic disease such as heart disease and some cancers. Fortunately, choosing nourishing food for meals and snacks can help you feel your best every day and prevent some chronic and other illnesses. Eat fibre-rich, whole grain products to keep your bowels healthy. Drink plenty of fluids, including water. Enjoy eating by sharing meals with family and friends. Recognize your body’s special needs, particularly as you age. The daily requirements for calcium, vitamin D, and vitamin B6 are higher for older adults. Vitamin D helps balance calcium levels in your body for healthy bones. You need more vitamin D as you get older. Vitamin D is found in milk, fortified soy beverages, egg yolk, and fish. Adults over age 50 should take a daily vitamin D supplement of 400 IU. Vitamin B6 needs increase as people age. Vitamin B6 is important for protein metabolism and brain function. Food sources of vitamin B6 include fish, beef livers, meat, poultry, whole grains, nuts, dried beans, peas and lentils. Vitamin B12 absorption decreases with age. Older adults absorb less vitamin B12 from foods and need to take vitamin B12 fortified foods or a supplement. Lack of vitamin B12 over a long time can cause a type of anemia, resulting in tiredness. Other symptoms include forgetfulness, difficulty thinking and concentrating, and possibly numbness or tingling in fingers and/or toes. Good food sources of vitamin B12 are milk products, meat, fish, poultry and eggs. Folate is one of the B vitamins important for a healthy heart and blood cells. A lack of folate may cause anemia. Foods with folate are dried peas, beans, lentils, orange juice, dark green leafy vegetables and other vegetables, fruits, nuts and seeds. Fibre is important for your bowel regularity and health. Certain types of fibre can help to lower cholesterol and to keep blood sugar levels normal. Fibre may also help to manage or keep a healthy weight. Foods with fibre include whole grains, legumes, fruits and vegetables. Fluids are important for good hydration, regular bowel function and good oral health. Seniors may not notice sensations of thirst and may not drink enough. Water, milk, and juice are the best sources of fluids. Moderate amounts of tea and coffee can also be counted as fluids. Sodium or salt use may increase as people age, possibly due to less sense of taste. Too much sodium in your diet can increase your blood pressure. Try using unsalted herbs, spices and seasonings in cooking instead of adding salt to foods. Limit the use of salty foods, including instant soup, sauce and gravy mixes, soy sauce, salad dressings, and salted meats such as ham, bacon and sausages. · Senior Friendly™ Fact sheets available on the Dietitians of Canada website at www.dietitians.ca. The first article featured in “Eating for Everest” will examine the issue of climber’s weight loss while at altitude. Weight loss is a common consequence of climbing and mountaineering at altitude. The physical challenges of climbing in rough terrain and deep snow with heavy weight clothing and gear are enormous. Some researchers estimate that climbers can burn up to 6000 calories per day in such extreme environments. Yet food intakes of climbers at altitude have been shown to fall by 10-50% depending on the rate of ascent and individual tolerance. Just when a climber needs food energy the most, a high altitude, low oxygen environment immediately reduces a climber’s appetite and interest in eating, making weight loss a serious concern. Weight loss at altitude represents the loss of lean muscle mass. Those lean muscles are the ones that are needed to get you up (and down) the mountain. Excessive weight loss caused by loss of appetite, exhaustion and stress can lead to further weakness and may mean the end of a long awaited dream trip. Fortunately there are strategies to put into place during the months leading up to the climb, as well as during the climb that can help minimize weight loss. Future articles will consider strategies to optimize nutrition during training. Seek out foods that feel good in your mouth, sit well in your stomach and are more likely to stay down, Common "hiking" foods such as jerky, trail mix, chocolate, cheese or nuts may take too much energy to chew, swallow and digest. Try to prevent food boredom, A tasty, easily digestible meal or snack can be a real highlight on a challenging climbing day. Consider a variety of foods that will please you, and try to avoid packing the same ones every day. Snack on small amounts of food frequently throughout the day and be sure to keep these handy and within easy reach. Drinking carbohydrate rich fluids is helpful to meet energy needs. Examples include sweet liquids such as apple cider, hot jello drinks, Gatorade, and sweet tea. Drink warm beverages if and when possible. They are great physical and emotional boosters! Most experts will suggest avoiding caffeinated beverages at altitude. However, the U.S. Army reports that some soldiers find relief from high altitude headaches by drinking a double strength of coffee. Experienced mountaineers will agree that physical training and practice climbs are essential prior to the big trip. In addition to the training, sports nutritionists would argue that taking the time to practice with a variety of food and fluids is just as important. Don’t wait until you reach altitude to discover that all the food you brought disagrees with you. Instead, practice eating at altitudes above 10,000 feet to see what your food and fluid preferences really are. You may be surprised. Peak Freak Guide Tim Ripple says “As much as I love chocolate, I can't even look at a chocolate bar above 26,000ft. If you like spicy food you might have a hard time with it at higher altitudes above base camp as I do”. Lastly, make the most of your pre-climb training time to strengthen your physical body and optimize your nutrition with professionally guided food and beverage choices and careful attention to the use of nutritional supplements. The trip is in sight and the hard work of training has begun. Pre-climb training will build your endurance, which will benefit you on the mountain. Strong training increases the volume of blood pumped by your heart and delivers more oxygen to working muscles. Training also increases the amount of reserve fuel (glycogen and fatty acids) that your muscles can store. Training will increase your body’s ability to burn carbohydrate for fuel during intense exercise and improve your muscle’s ability to clear lactic acid from the blood. This is beneficial as a build up of lactic acid contributes to fatigue. Nourishing food is essential to maintain your pre-climb training schedule. Nourishing food and fluids will provide energy to support consistent training and muscle recovery, will reduce the risk of injury (and the time lost due to injury) and improve your immune function making you less likely to fall ill. The protein, carbohydrate and fats in your diet, the vitamins and minerals, phytochemicals and fluids provide an essential mix of nutrients for strong training and recovery. Does your training diet measure up? Take a sheet of paper and write down all the food and beverages that you ate and drank yesterday from morning until bedtime. If yesterday wasn’t a typical day for you due to illness or travel, then pick the day before. As you read through the following principles of sports nutrition, check to see how your diet measures up. Can you spot some room for improvement? Fresh, frozen or canned vegetables and fruit should make up the largest percentage of your diet each day. Choose the most brightly colored ones (red, yellow, orange, dark green) for that extra nutritional boost from vitamins A and C. Pure fruit juice can be a good choice, just choose small portions. Unsweetened apple juice has the same concentration of sugar as Coca-Cola! After vegetables and fruit, grain products are the next biggest group of foods to fill your plate with. Examples include pasta, rice, bread, cereal, muffins, crackers and pitas, in fact all foods made from wheat, rice, oats, corn and barley. Be sure to choose whole grain varieties of bread, rice and cereal more often than the refined grains as they have the added benefits of fibre, vitamins and trace minerals. Meat and vegetarian protein alternatives provide important nutrients such as iron, zinc and magnesium as well as protein and fat. Athletes need protein to help repair muscle tissue, however high protein “sports” diets and protein supplements are often unnecessary and can be dangerous so consult with a dietitian or physician first. Instead, choose protein rich foods at each meal, including lean meats and fresh or canned fish, as well as a vegetarian meal each day (or several times a week) using beans, lentils, nuts and nut butters, seeds and tofu. Milk and milk alternatives provide the athlete with calcium, vitamins A, D and B12, protein and fat. Calcium and vitamin D are important for maintaining bone strength during high impact and load bearing activities as well as prevention of muscle cramps. As dairy products are high in saturated fats, choose lower fat milk, yogurt and cheese and/or choose “fortified” soy beverage every day for good nutrition. Depending on your particular needs, and whether you are male or female, you may need these foods 2-4 times per day. A glass of cold milk is an excellent and easy choice as a recovery drink after a training session. Fats and oils in modest amounts are an important source of calories and nutrients for the training diet. Choose higher quality fats and oils that contain more monounsaturated fats such as those that are soft or liquid at room temperature as well as olives, nuts, seeds, avocadoes and fattier fish. Fats are high in calories, so use (and choose) them wisely. On your food list, did you also include the cookies, sweets, cold beer, potato chips and other things that we commonly eat and drink? What did you eat in the car on the way home? What did you eat while preparing supper? Everything you put in your mouth counts towards your body’s overall nutrition. When you burn extra calories with training, it is important to fuel your body with nourishing foods before and immediately after working out. Sweets and treats can certainly fit in to your training diet, but make sure the majority of your food and beverages are healthy and nutritious. Wondering what to drink? The next article will focus on the importance of hydration and electrolytes. It’s essential that athletes drink plenty of fluids before, during and after exercise to replace fluid lost from sweating. Sweating is an effective way to cool your body, but sweating can lead to dehydration, especially if exercising in the heat. Wondering what beverage to choose? This article will discuss hydration and offer guidelines for choosing a beverage. During exercise, our body loses water and electrolytes through sweat and breathing. Electrolytes are substances that become ions in solution and conduct electricity. Maintaining a fine balance of these electrolytes (i.e. sodium, potassium, chloride, and bicarbonate) in our bodies is essential for normal function of our cells and our organs. Simply, the more fluids we lose through sweat and respiration, the more electrolytes we lose which can affect muscle function. Even a small amount of dehydration can significantly impair performance. Sodium is the major positive ion in fluid outside body cells. Sodium regulates the total amount of water in the body. The movement of sodium in and out of body cells is critical in the generation of electrical signals and many processes [K1] in the body, especially in the brain, nervous system, and muscles, require electrical signals to function. Too much or too little sodium can be extremely dangerous. Potassium is the major positive ion found inside cells. Among the many functions of potassium in the body are regulation of the heartbeat and normal function of the muscles. A disturbance to the balance of potassium in the body can profoundly affects the nervous system and increases the chance of irregular heartbeats (arrhythmias), which can be fatal. The bicarbonate ion helps to maintain the normal levels of acidity (pH) in blood and other fluids in the body. Our body’s acidity is affected by foods or medications that we ingest and the function of our kidneys and lungs. For most athletes who exercise for one hour or less, plain cool water is the number one choice. According to the American College of Sports Medicine, athletes exercising less than one hour generally don’t benefit from using sports drinks. However, the longer you exercise, the greater your fluid losses, and the more your body will benefit from additional electrolytes and carbohydrates for energy. This is where sports drinks can be very helpful before, during and following intense exercise. Sports drinks provide fluids for hydration, carbohydrate for energy, and electrolytes to replace those lost in sweat. For activities lasting longer than an hour, choose a sport drink that contains 4 to 8% carbohydrates along with some added sodium. According to Kristine Clark, sports nutritionist with Penn State University, "A sports drink can do many great things to increase energy levels without the complications of digesting and absorbing a meal". If you prefer fruit juice to a sports drink, then great, but always dilute fruit juice (one part juice to one part water) to prevent stomach upset. In hot, humid conditions with prolonged exercise the body needs more fluids to replace sweat losses and prevent heat injury. A general guideline is to aim for a minimum of ½ -1 litre of fluid per hour. Check back for the next entry on “Eating for Everest” soon.